The city authorities of Gori have refused humanitarian aid from Russia. 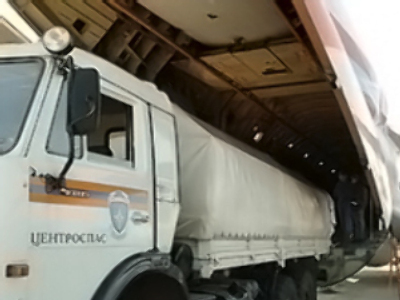 A convoy carrying food for the Georgian city was ordered on Monday to return to Tskhinvali, according to the Russian Emergencies Ministry. The humanitarian convoy was unloading its cargo at a local church in preparation for its later distribution when a man came and demanded that the trucks left. He reportedly said the city needed no help, according to ITAR TASS news agency. The ministry has been making a daily delivery ofng 40 to 45 tonnes of food to Georgia for the last four days, said Emergencies Minister Sergey Shoigu on Monday. The normal food supply was disrupted after local authorities fled from advancing Russian troops. Russia is now withdrawing its military contingent from Gori. Last Thursday it handed over control of law and order in the city to Georgian police.